CAVFEST 2013 RAISED OVER £13,000 – THANK YOU ALL FOR YOUR SUPPORT! In September 2011 Cavendish PTA, in association with WestFest hosted the hugely successful unique CavFest fundraising music festival, raising over £9,000 for Cavendish Community Primary School funds. 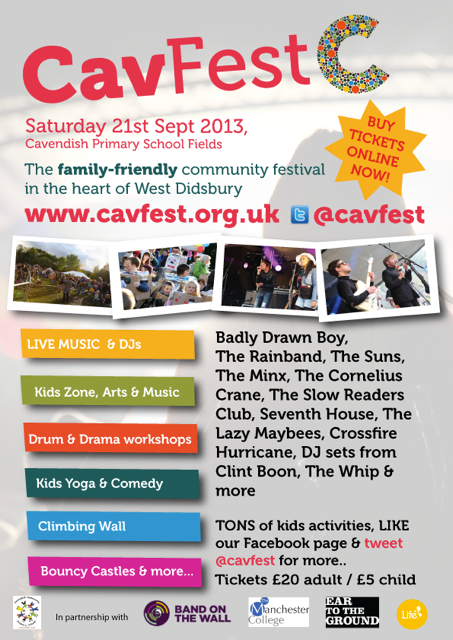 Cavendish PTA is pleased to announce that we will be staging CavFest again on Saturday 21st September 2013. ‘Early Bird’ Tickets went on sale on 30th January and sold out within 48 hours, predominantly via Twitter, Facebook, our mailing list and word of mouth. The full line up for CavFest 2013 has now been announced; expect a terrific family-friendly festival with great music & lots of kids activities. For enquiries or information, please visit our dedicated CavFest website, email enquiries@cavfest.org.uk or follow @CavFest on Twitter or Facebook.